Apple's voice activated features have received some new features as part of iOS 8. Siri is a virtual voice activated personal assistant that can answer your questions, call your friends, check the weather, and much more. Now it can be activated hands free by saying, "Hey, Siri." Previously, users would have to press and hold the home button to activate Siri. The new feature will allow people with physical disabilities to easily activate Siri. The hands-free activation feature does have one major caveat: the device must be plugged in and charging. Users who need or want to access this feature on- the- go can purchase a battery case to utilize this feature. It is possible that future iOS devices will not require a power source to use the "Hey, Siri" feature. In addition, when dictating a question to Siri or dictating text into an app the recognized words appear almost instantly after being spoken. To use dictation bring up the keyboard and then press the microphone icon next to the space key. With words appearing as you speak it is easier to identify mistakes which makes the dictation process faster. Dictation can be a useful feature for people who struggle with spelling and people who have difficulty using a keyboard. These features are available for devices running iOS 8.
iOS 8 includes a new greyscale mode that could benefit people with visual impairments. The new mode is included in addition to inverse color which was previously available. The new option will reduce the bright colors and possibly reduce glare to make the screen easier to see. Greyscale and inverse color can be enabled simultaneously for further visual changes. Even for people without visual impairments greyscale maybe made the screen slightly easier to view outdoors. 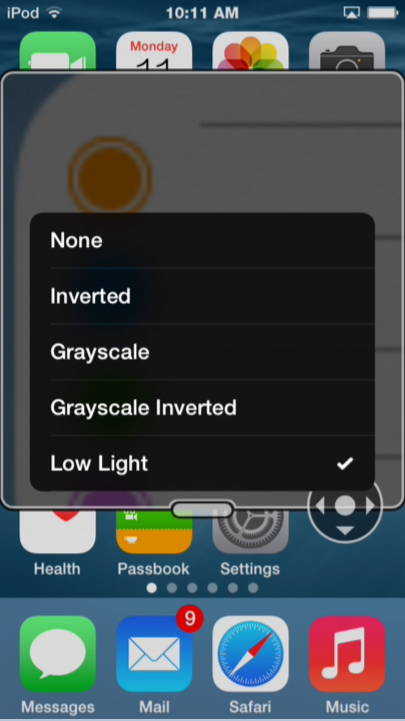 To enable greyscale navigate to Settings > General > Accessibility > Greyscale. Please note that the above screenshot is an altered colored screenshot. Guided Access is one of the many iOS features being enhanced in iOS 8. Guided Access is used to keep a someone on a single app using a password. For example, if you want your child to read a book and not watch a video you can lock them into the reading app, eliminating the ability to navigate to other apps. With Guided Access enabled, a child or student will need a passcode in order to enter another app. To learn more about Guided Access click here. One of the enhancement allows users to end a Guided Access session with their finger print using Touch ID. Similar to how third-party developers can implement Touch ID authentication, Guided Access will also take advantage of finger print reading technology. Instead of entering a passcode, users with a Touch ID enabled device will be able to end the session simply by placing their finger on the Touch ID sensor. This feature will simplify the processes of ending Guided Access and potentially eliminate the frustration resulting in forgotten passcodes. The other enhancement allows students and parents to set a time limit. 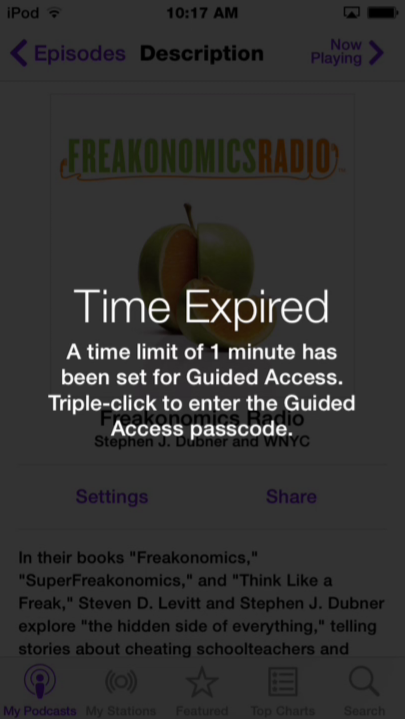 After the time expires the app will not respond until the correct passcode or finger print is entered. Periodically a small message appears showing how much time is remaining. This feature could be perfect for test taking by ensuring students stop answering questions after the allotted time expires, or for setting a time limit for playing games- when the time limit is reached, the app will not respond. To enable Guided Access navigate to Settings > General > Accessibility > Guided Access. iOS 8 includes enhancements to VoiceOver, the built-in gesture based screen reader for people with visual impairments. One of the improvements is a new built-in Braille Keyboard for Six-Dot input. The new feature is similar to the BrailleTouch app released a few years ago with one major difference; the built-in option can be used to enter text into any app directly. The option can be enabled in the VoiceOver rotor. The Braille keyboard will offer VoiceOver users who are familiar with Braille an alternative, and possibly much faster text entry method. iOS 8 will also offers third-party keyboards such as Fleksy which could also offer significantly faster text input for VoiceOver users. Once you turn the Braille keyboard on six positions will appear on screen representing the six Braille dots. When the device is held with the screen perpendicular to the floor it automatically enters screen away mode. When using this mode the user faces the screen away allowing three fingers from each hand to contact the screen. As the user begins to type the six virtual dots automatically reposition themselves to compensate for changes in your grip. The dots can also be recalibrated by holding down the three right hand fingers and then the three left hand fingers immediately after. This positions the dots directly under your fingers. When the device is set on the table or another flat surface the Braille keyboard enters tabletop mode. This mode would seem to be ideal for an iPad can can also be used on smaller devices. It does take some care to ensure that the keyboard does not switch between tabletop and screen away mode accidentally. In both modes typing did seem difficult on the small screen, but some practice seemed to improve typing speed. This new option allows typing with contracted or uncontracted Braille. When typing a swipe right adds a space and a swipe left deletes the last character typed. This new method of typing is very sensitive a will likely require practice before mastering. If you use this feature frequently, it maybe helpful to purchase a case that boarders the screen to avoid trying to type on the bezel. To enable the Braille keyboard go to Settings > General > Accessibility > VoiceOver > Rotor > Braille Screen Input. Then, when VoiceOver is enabled, rotate the rotor until Braille screen input is selected. It exciting to see all the new third-party keyboard options for iOS 8, but for VoiceOver users, Apple's own Braille keyboard maybe the most exciting of all. iOS 8 includes some new accessibility features and many improvements to existing features. One of the new features is called Speak Screen which allows users to quickly have text on the screen spoken aloud using text-to-speech. Speak Screen is included in addition to Speak Selection which allows users to highlight text and press speak to have content read aloud. Unlike Speak Selection, which requires text to be highlighted first, before reading the text aloud, Speak Screen does not require users to highlight the text they wish to have spoken. Especially for longer articles or emails, this highlighting process could be time consuming and frustrating. Speak Screen solves the problem by speaking all text on the screen with a simple two-finger swipe down from the top of the screen. After swiping down with two fingers, text starts to be read aloud with text-to-speech, and the Speak Screen menu appears on top of your current app. This menu allows you to stop and start speech, adjust the text-to-speech speaking rate, and navigate through the text being spoken. Instead of having to re-highlight text if you want to hear a paragraph again, Speak Screen offers simple navigation buttons. The menu can also be hidden to allow full view of the screen and accessed again through a small floating button. Just like Speak Selection, Speak Screen has the option to highlight text as it is spoken, making it easier for sighted readers to follow the text as it is being spoken. Just like all of the accessibility features in iOS 8, Speak Screen can use the Alex text-to-speech voice which many users prefer. While Alex is a very high quality text-to-speech voice beware, it takes up almost one gigabyte of storage. Speak Screen can also be activated through Siri by saying "speak the screen." To enable Speak Screen on a device with iOS 8 go to Settings > General > Accessibility > Speech and then toggle on Speak Screen. Speak Screen is only available for devices running iOS 8 or higher. 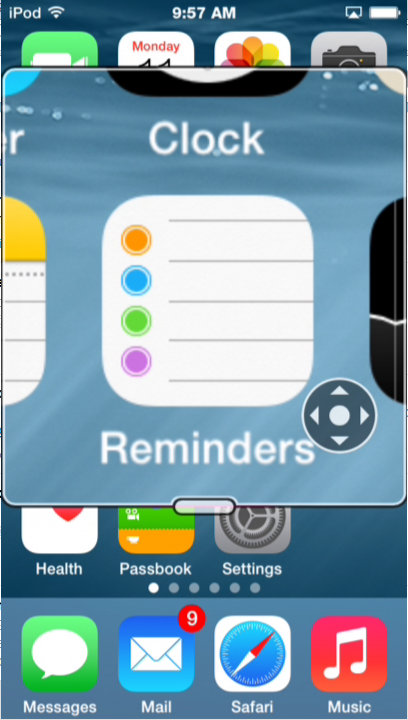 In previous versions of iOS, zoom was only a simple full screen magnification. 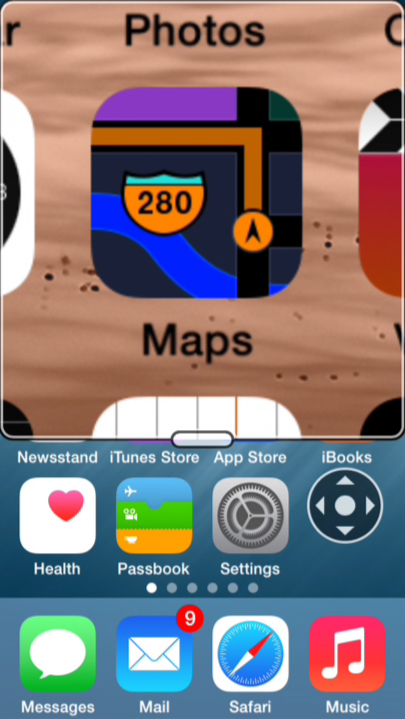 With iOS 8, Apple has vastly improved zoom with partial screen window zoom, filters, and smarter magnification options. Zoom is a vital feature for people with low vision and its new features in iOS 8 makes it even more useful. One of the most noticeable enhancements is the ability to magnify certain areas of the screen while leaving the rest of the screen unmagnified. As opposed to full screen zoom, the zoom lens allows for more easy navigation while still allowing certain important areas to be magnified. Users can change the size of the magnified area and pan around the screen in order to magnify different areas. An option is available to add a zoom control to the screen which acts like a virtual joystick for controlling which areas of the screen are magnified.Within the magnified area, users can apply filters to make viewing easier. The filters available are inverse colors, greyscale, low light, and greyscale inverse. As pictured above, iOS 8 allows users to choose not to magnify the keyboard. This can make typing on software keyboards much easier while still allowing the text being entered to be enlarged. 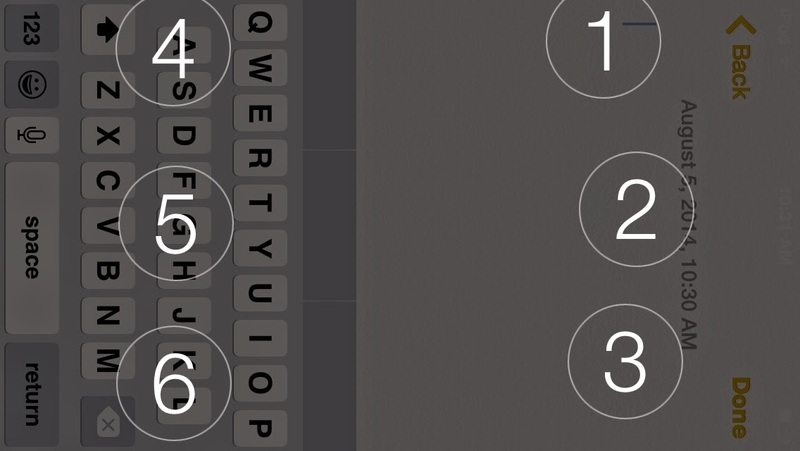 When the keyboard is magnified some keys are cut off requiring panning to type, iOS 8 eliminates this problem. Zoom also includes the ability to follow the VoiceOver cursor focus. Meaning when the VoiceOver cursor is focused on an app or button, that app or button will be enlarged in the zoom window. 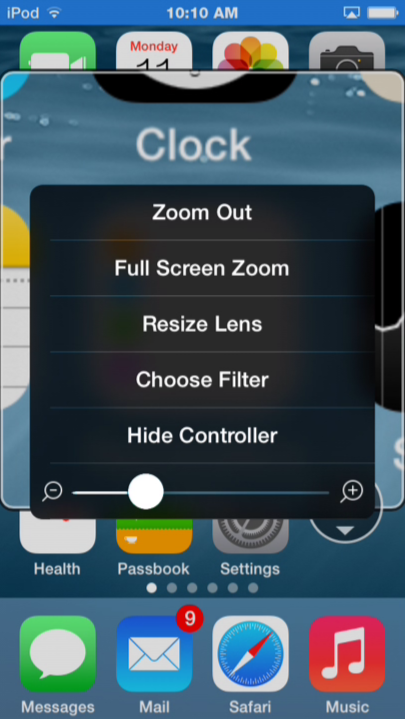 These new zoom options are just one of many exciting accessibility enhancements included in iOS 8. The improved zoom will benefit many users with visual impairments and is a huge improvement over zoom in iOS 7. To enable zoom go to Settings > General > Accessibility > Zoom. For more screenshots of zoom in action click read more below. Today, Apple released iOS 8 the latest software update for iPhone, iPad, and iPod Touch. The new software, which is available for free, includes many new features and enhancements, including new accessibility features and tools that will allow developers to make the next generation of apps. Apple has not stood still in terms accessibility and as a result, iOS 8 is truly the most accessible and inclusive iOS version to date. Some of the most exciting new accessibility features are included in iOS are ready to use right after updating. 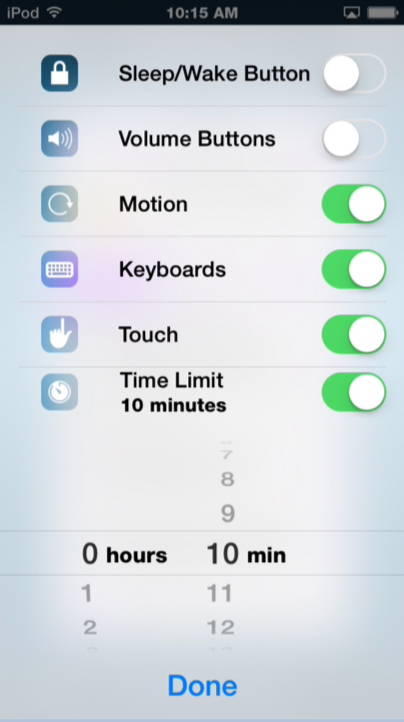 These features are developed by Apple, and most are found under Settings > General > Accessibility. Speak Screen is one of the new accessibility features that allows users to quickly and easily have content on the screen read with text-to-speech with a simple two finger swipe down gesture. Unlike older versions of iOS which required users to highlight sections that they wished to be spoken, Speak Screen does not require any highlighting. 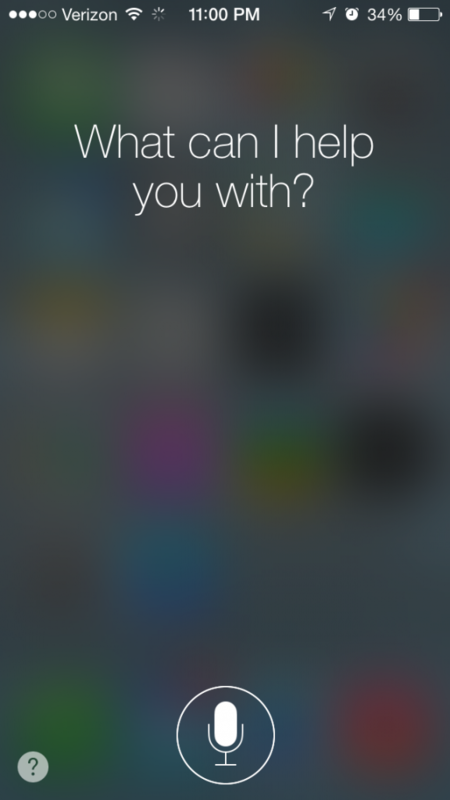 Users can even ask Siri to �speak the screen� to start text-to-speech. Apple�s highly acclaimed screen reader, VoiceOver, also received some substantial updates. Now, VoiceOver users can enter text using a system-wide virtual six-dot Braille keyboard. Zoom is also vastly improved with windowed magnification and filters. Guided Access and AssistiveTouch have seen smaller improvements. In addition, all accessibility features that use speech will now be able to use the Alex text-to-speech voice that many Mac users enjoy. All of these features are included with the iOS 8 update. Stay tuned for in depth information about the features discussed above in the coming days and weeks. With iOS 8, Apple has given developers tools to make the next generation of great apps. Hopefully, assistive app makers will be able to take advantage of these new features to help people with various needs. Developers can now make system wide keyboard apps. 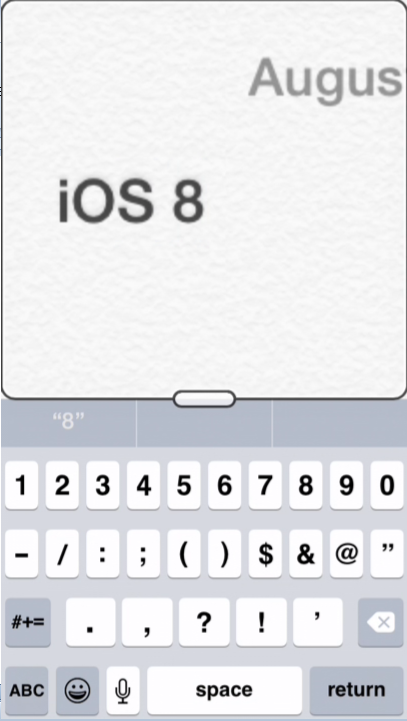 iOS keyboards will now be able to enter text into any app if the developer updates the app for iOS 8. For example, Fleksy and SwiftKey are expect to receive an update shortly to enable text entry into any app. Developers can also add the ability to unlock their app using Touch IDfinger print recognition for devices with Touch ID. Lastly, developers can create extensions to allow their app to perform functions within other apps. For example, a translation extension could be used within Safari to eliminate the need to switch apps. These features open up a whole new world to app developers and it will be exciting to use some of the new apps that take advantage of these new developer features. While some apps have already been updated to take advantage of the new developer features in iOS, many have not been. Check back to read about some apps that are taking advantage of these new developer features in ways that can help people with disabilities. iOS 8 is a free update that you can download now. Stay tuned to the Assistive Technology Blog to learn more about the new included accessibility features and about apps that take advantage of the new developer features. Labels: apple accessibility, iOS 8 Accessibility, ios accessibility, iOS special needs, ipad, iphone, iPhone 6, iPod touch, iWatch accessibility, Speak screen, VoiceOver, What is speak screen? The general consensus is that Apple will introduce new iPhones with larger screens in a few days. With many people with disabilities using Apple's flagship device for their accessibility needs a change can have a large impact on users. From a software prospective iOS 8 will offer many accessibility improvements, but hardware is also an important aspect of accessibility. The larger screen will certainly benefit some users with special needs, but may also cause problems for others. Users with low vision may benefit the most from the larger viewing area. On current iPhones, with large text enabled, only a small amount of text is able to fit on screen. A larger screen will allow more text to fit on screen requiring less scrolling for users who prefer or require large text. The large screen will also give VoiceOver users more space to use three or four finger gestures. On the other hand a larger screen iPhone may pose a challenge. Users with physical challenges may have a difficult time reaching all the controls. Also users who prefer using their phone in one hand and users who can only use one hand to operate their phone may find it difficult access all areas of the screen. It is possible that Apple will come up with a software solution to these possible challenges, making one handed use a breeze. When Apple introduced the iPhone 5 it claimed that the larger screen was a perfect size for one handed, use so it will be interesting to see how the next iPhone is marketed. People who use Apple devices as assistive devices should be excited about the company's upcoming announcement. Regardless of any hardware changes Apple's iOS 8 includes unmatched accessibility features for people with a variety of needs. The potentially larger screen size will likely benefit most users. The benefits and trade-offs of larger screen phones has been explored with Android phones for years, and hopefully Apple has been able to iron out any lasting challenges. Aside from the form factor, Apple may introduce new software or hardware features that impact people with disabilities at their event. Stay tuned for information about how Apple's announcements impact accessibility.